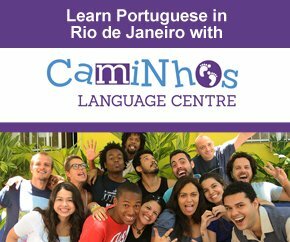 So what is the best way getting around Rio? Well there are quite a few options. The public transport system in Rio is all in all a chaotic phenomenon; There are various types of buses, several types of taxis with different rates, motorcycle taxis in the favelas, traffic changing directions; I could just go on. I will try to give you the most important information and I hope it will be of help. I start with a good tip: On all types of motorised transport in Rio it is best to carry change, many times the driver can’t even break a 20 R$ bill, flying a 50-bill on the wrong bus can also attract the wrong attention. What is important to remember is that some types of transport can be just fine at one certain hour or weekday while on a weekend at another hour it’s not. There are so many gringos I met that taking the bus to Lapa on a Friday evening at 9 PM felt it was just fine, When I’ve been telling them that the same thing on a Monday is not advisable they have a hard time to understand. I have explained this and a lot more in my Buses in Rio section. 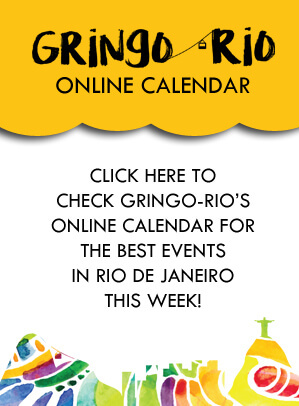 The reason to be cautious at these times is the risk of getting robbed; getting around Rio has to be done with sense. The same goes for the various vans and kombis that are at times offered as a supplement to the buses. Buses is the mean of transport that takes people everywhere, it can be quite and experience with crazy drivers and so bumpy it makes your kidneys hurt. Best to have change, a taxi driver can most of the time sort the situation out by changing with a nearby pharmacy or in a newsstand, if it’s in the middle of the night it would be trickier. In my Taxis in Rio you can find out more about this type of transport. 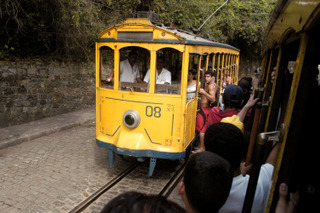 An exception from the rule is the subway, aside from some route changes depending on the traffic directions it is very dependable and the pride of Rio de Janeiro’s public transport system. Read all about it in the Subway in Rio section. Walking is perfectly fine if you stick to where other people walk, it’s when the streets are empty or if there are some dodgy characters around you will have to be cautious. There are also some areas that are particularily bad certain times. The city centre is fine as long as the shops are open; after that the shop securities go home and it turns in to a no-go zone. During rush hour walking a few blocks is faster than bus or subway. A really nice way to get around in Rio is on a bicycle, I have explained all about renting and where you can go in Bicycle in Rio. Renting a car is also a good idea if you want to drive around in Brazil, go to Rio de Janeiro Car Rental to find out about renting, driver’s licenses and so on.